A small bounce was expected to begin for this week, which is exactly what has happened. 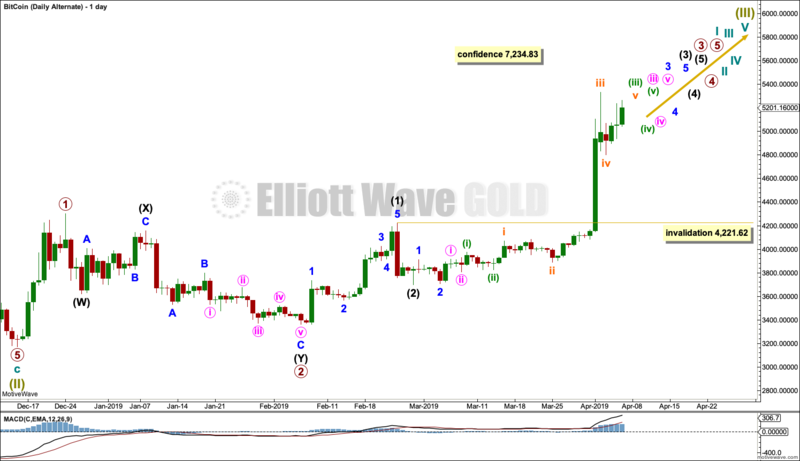 A small range inside day fits short-term expectations for the Elliott wave count. A bounce was expected to end at resistance yesterday, and thereafter downwards movement was expected. Members were advised to enter short. A strong downwards day should see members with profits. A little more upwards movement was expected for Wednesday to end about 1,307 to 1,310. 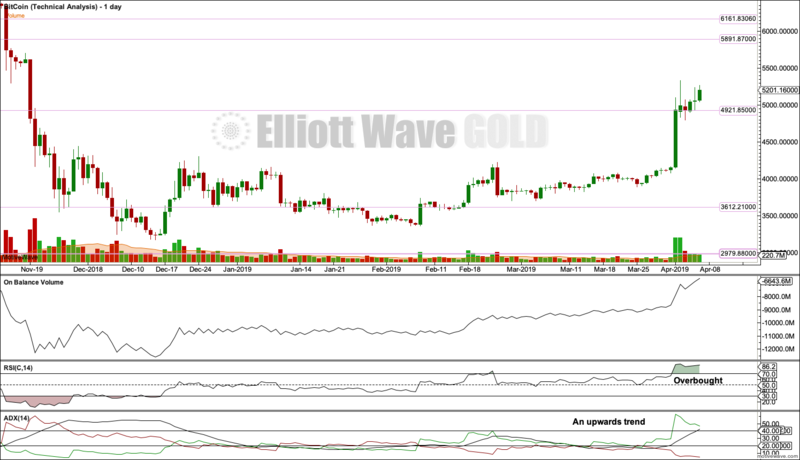 Upwards movement has continued to reach a high at 1,310.17 so far. Upwards movement remains below the invalidation point and price remains within the base channel. The next target at the 0.618 Fibonacci ratio is now used. Last analysis on the 14th of March expected a downwards breakout from a consolidation, but this is not what has happened. Price broke above identified resistance on the 1st of April with support from volume. Summary: More upwards movement is expected for the short to mid term. The question is whether this is a counter trend bounce within an ongoing bear market or the beginning of a new bull market. It would be safest to assume that the bear market will continue while Bitcoin remains below 7,234.83. The final target is about 1,924, but it may be much lower than this; it is possible this bear market may see the end of Bitcoin. A new high above 7,234.83 would indicate Bitcoin may be forming a new bubble to take price substantially above 19,870. The data used for this analysis now comes from Yahoo Finance BTC-USD. Updates to this analysis are in bold. At this stage, it remains likely the the collapse of Bitcoin is incomplete. 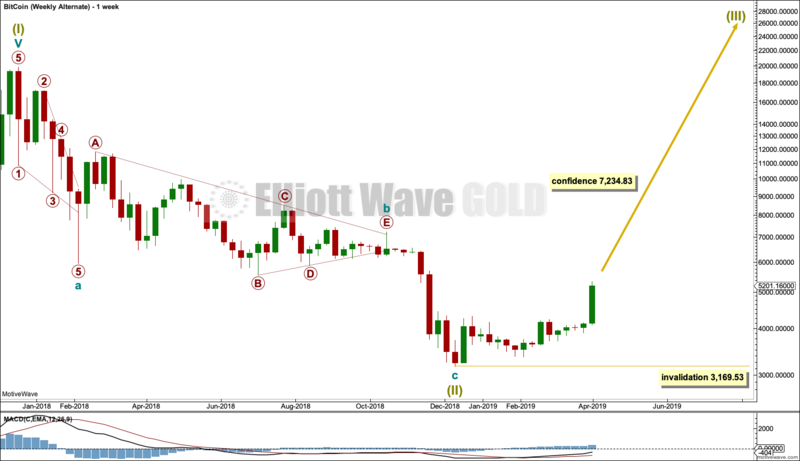 The main Elliott wave count outlines a continued collapse. Now it is also possible that Bitcoin has found a new low and may be forming a new bubble. 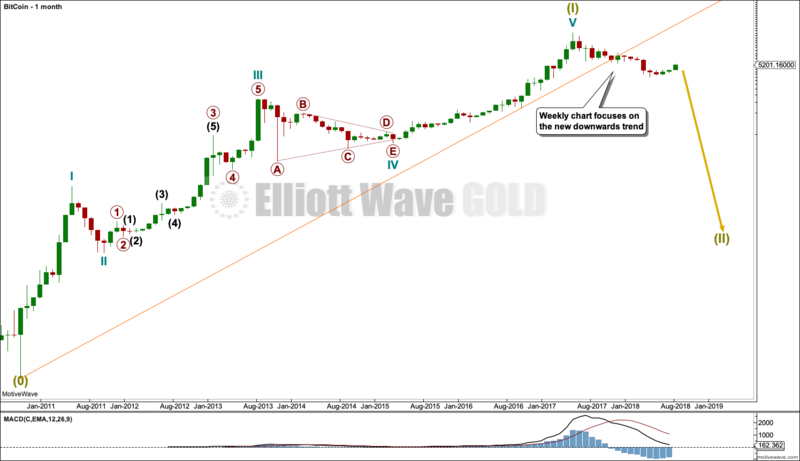 The alternate Elliott wave count outlines this idea. It is possible to see a completed five wave impulse upwards for Bitcoin. I am unable to find reasonable Fibonacci ratios within this wave count. It appears that Bitcoin may not exhibit Fibonacci ratios very often between its waves, so this makes target calculation impossible. Classic technical analysis was used to identify a high in place on December 23, 2017. What is very clear from this chart is that Bitcoin is a classic bubble. This looks like an even larger bubble than the Tulip Mania. The only thing about which I am certain is that this bubble will pop and Bitcoin will collapse. Confidence that Bitcoin was most likely crashing started since the Forever trend line was breached in June 2018. Bitcoin tends to behave like an extreme commodity: price moves upwards for about 2 – 4 weeks in a near vertical movement at the end of its rises. Following this vertical movement the resulting downwards movement is very deep (in percentage terms) and often very quick. The next rise begins slowly with basing action over weeks or months, and then as the rise nears its end another vertical movement completes it. Also, there are volume spikes just before or at the end, which is another feature typical of commodity like behaviour. This has happened now several times. The most notable instances are the rise up to the week ending 24th November, 2013, and the week ending 5th June, 2011. The following sharp drops were 94% and 93% respectively. The last instance was the rise up to the last all time high for Bitcoin at 19,870.62 on the 17th of December 2017. If this current drop continues like the first two examples, then a reasonable target may be about $1,390.94 or below. Super Cycle wave (II) would most likely be a zigzag, but it may also be a flat, combination or triangle; a zigzag would subdivide 5-3-5. It is possible that cycle waves a and b may be complete within the expected zigzag of Super Cycle wave (II). Cycle wave a will fit as a leading contracting diagonal, and cycle wave b fits well as a running contracting triangle. The target calculated expects cycle wave c to exhibit a Fibonacci ratio to cycle wave a. Bitcoin rarely exhibits Fibonacci ratios, so this target does not have a good probability. If this target is wrong, it may not be low enough. Another frustrating aspect of Bitcoin is it does not fit within Elliott channels. Because it begins movements slowly and ends them quickly, it forms curved waves which breach channels early only to continue to new highs or lows. The channel on prior analysis is removed because it may not show where the current bounce finds resistance. Cycle wave c must subdivide as a five wave motive sturucture, most likely an impulse. Within cycle wave c, primary wave 1 may be complete. Primary wave 2 is now relabelled as an incomplete zigzag. Intermediate wave (B) may be a complete regular contracting triangle. Intermediate wave (C) may be an incomplete impulse. Primary wave 2 may not move beyond the start of primary wave 1 above 7,234.83. With an increase in upwards momentum and a breach of the channel containing prior downwards movement, it is time to now more seriously consider this alternate. It is also again possible that Bitcoin may have found a low and may be in the early stages of a new bull market. This wave count expects that the crash in price for Bitcoin was only 84% of value from the all time high. While this is possible, it would not follow the more common pattern of Bitcoin to crash over 90% in value. This must still reduce the probability of this wave count. 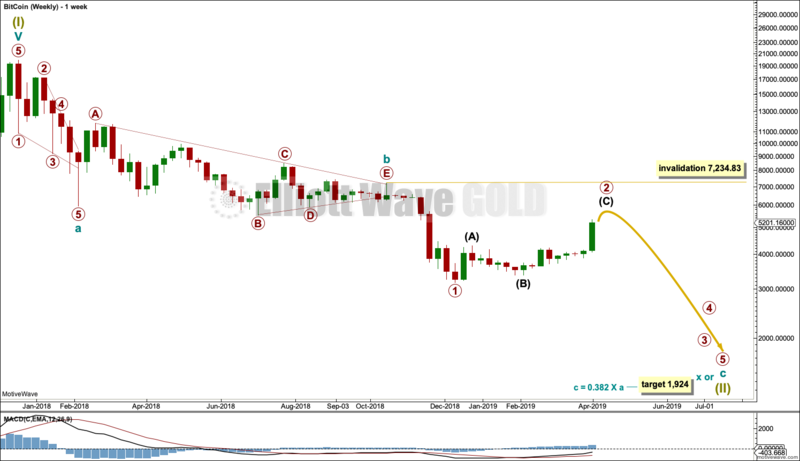 Within super cycle wave (III), no second wave correction may move beyond the start of its first wave below 3,169.53. A new bull market (to form a new bubble) may have begun with a series of overlapping first and second waves. A third wave now at five degrees may be about to unfold higher. Typical of commodities, Bitcoin exhibits swift and strong fifth waves. This tendency is especially prevalent for fifth waves to end Bitcoin’s third wave impulses. 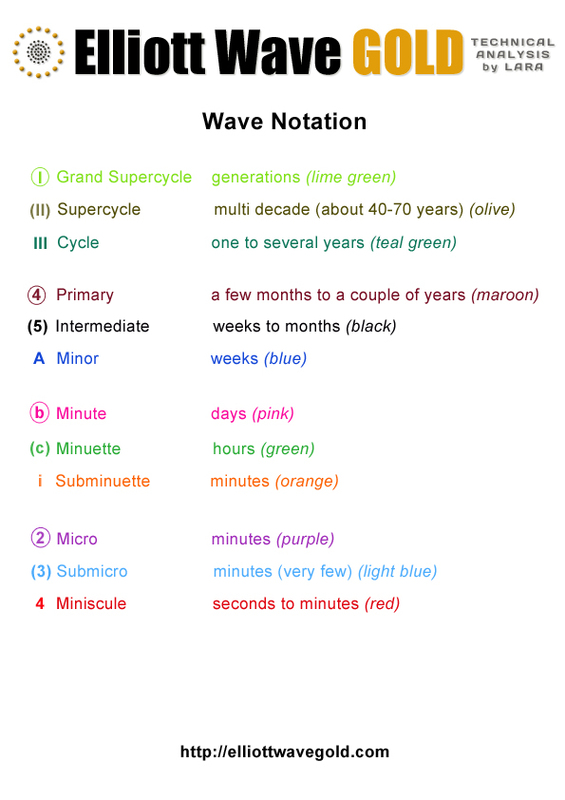 Any one or more of subminuette wave v, minuette wave (v), minute wave v, minor wave 5, intermediate wave (5) or primary wave 5 may be very swift and strong. Look out for blow off tops ahead, to be relieved by small consolidations. 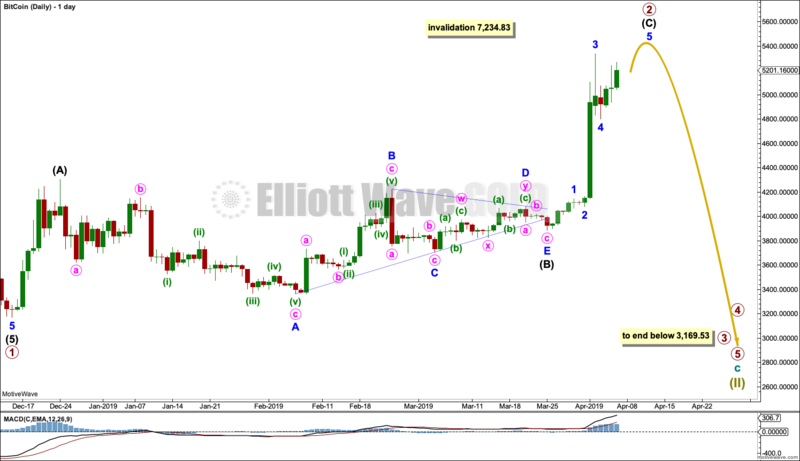 Within this current impulse, intermediate wave (4) may not move into intermediate wave (1) price territory below 4,221.62. – Three clearly separate instances of RSI reaching oversold on the daily chart, separated by bounces. – ADX did not remain very extreme for very long at all on the daily chart. – On Balance Volume exhibited weak single bullish divergence at the low. – RSI reached oversold and remained deeply oversold for three weeks; at the low there was only single weak bullish divergence with price. – ADX remained very extreme for the last seven sessions to the low. – At the low, On Balance Volume did not exhibit bullish divergence with price; it remained bearish and then exhibited further bearishness after the low as it continued to decline as price began to rise. For the current fall in price, the current Elliott wave count expects the fall to be larger in terms of duration than the previous two noted here, and at least equivalent in terms of price movement in that a fall of over 90% is expected now. So far at the lowest low from the all time high Bitcoin has only retraced 84%. While this is deep, its corrections are usually deeper than this. At major highs, Bitcoin usually exhibits near vertical upwards movement for about two weeks which ends with strong support from volume. Thereafter, major highs are usually indicated by a bearish candlestick reversal pattern on the daily and / or weekly chart. 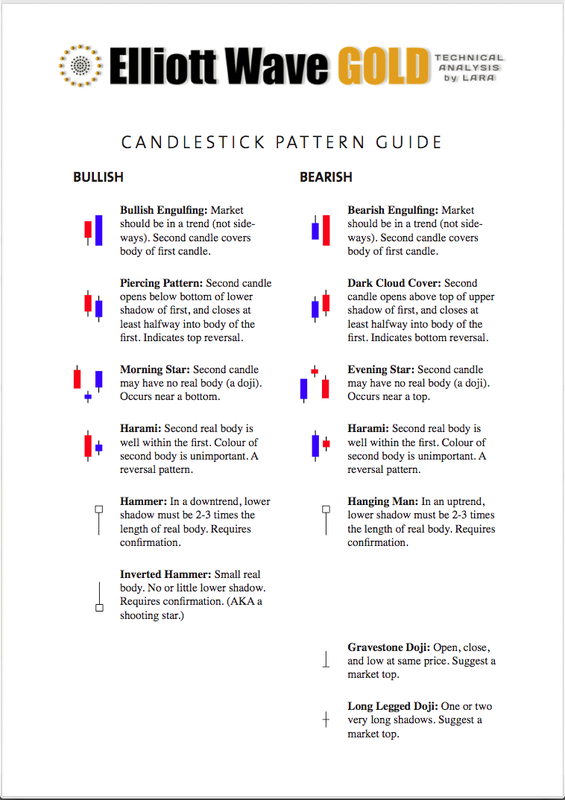 The current upwards movement has not yet exhibited vertical movement for long enough and there is currently no candlestick reversal pattern on either the daily or weekly chart. At this stage, it would be reasonable to expect Bitcoin to continue to move higher, at least for the short to mid term. Published @ 09:00 p.m. EST. A counter trend bounce was expected to end most likely about 1,297 to 1,301. The high for Monday is at 1,303.15, just slightly above the target range.